Copyright© 2011 Accordions Worldwide. All rights reserved. Charles Nunzio, 97, of Basking Ridge passed away on October 19, 2010. Born in Sicily, he came to the U.S. at the age of 8 where his parents settled in Newark. He became a world-famous accordionist, teacher, composer, and arranger. He had a music studio in Newark and later in Nutley where he trained many champion accordionists who became successful professional artists. He made his debut in a recital at Town Hall in 1933, and an appearance in Carnegie Hall the following year. 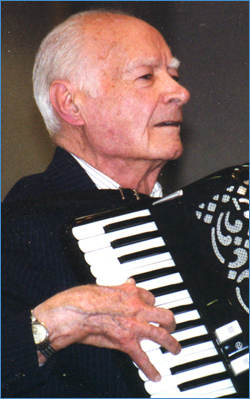 In 1938 Charles Nunzio became a founding Board member of the American Accordionists Association along with Pietro Frosini, Abe Goldman, Sydney Dawson, Anthony Galla-Rini, Charles Magnante, Pietro Deiro, Gene Von Hallberg, Joe Biviano, John Gart, Sam Roland and Byron Streep. In the late 1930's he was doing an average of 35 radio shows a week on WOR, NBC, CBS and making commercial recordings for Decca, Victor, and Columbia. His 40-piece accordion orchestra won first prize at the 1939 New York World's Fair. He also performed with Guy Lombardo, Rudy Vallee, Meyer Davis and Lester Lanin. During WW II he enlisted in the US Navy, where he played on coast-to-coast programs with the "Blue Jackets". Later, stationed at Bunker Hill Naval Air Station, Peru, Indiana, he assembled a six-piece orchestra, the "Melody Mates." They played three radio broadcasts weekly and all the dances for the Navy personnel. A consummate performer, he received many awards, one of which summarized his 70-year career: "Presented to The Legendary Charles Nunzio in recognition of your contributions in developing the accordion's American Evolution as artist, teacher, composer, and innovator and as an inspiring idol to so many accordionists. The impact of your contributions will forever be felt." He was predeceased by his wife Helen (Vitiello) Nunzio and is survived by two sons, John of Montville and Charles of Nutley, many nieces and nephews and long-time companion Jean Garzione of Basking Ridge.